In the drawing fennel ordinary, or fennel pharmaceutical, under a letter A – a pestle in a section, under B-a flower, With – a root is represented. Belongs to family of umbrella, is a perennial grassy plant. Fruits of fennel have the same medical application, as well as an anise, they are used as means for treatment of a stomach and as antitussive too. A stalk with a glaucescent raid, branchy, about 1 m high. All leaves vaginal, lower petiolar, repeatedly cut on narrow segments, the top almost sedentary. Inflorescences – the difficult umbrellas located on a top of a stalk and branches. Flowers small, yellow. Blossoms in July-August, fructifies in September. 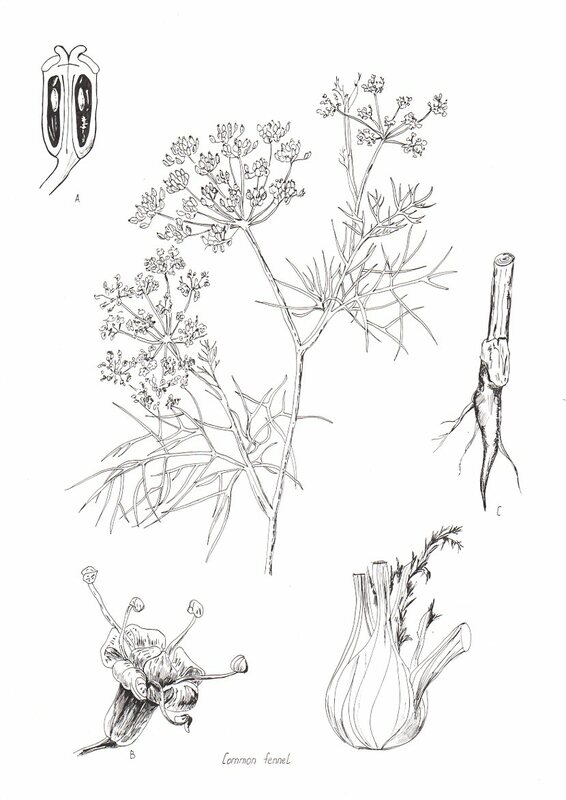 Fruits of fennel contain 4-6% of essential oil.